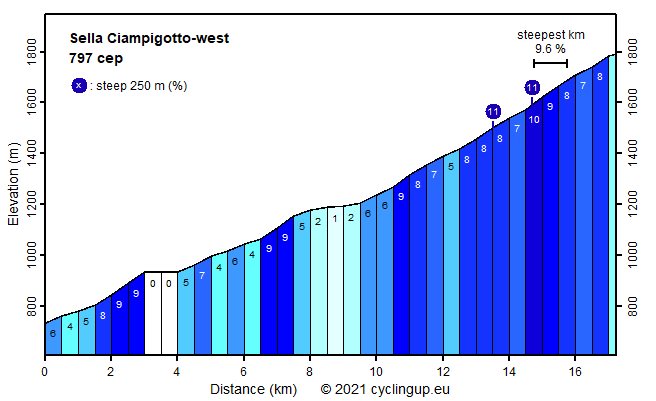 This is a wonderful climb for road cyclists. There is little traffic and the surroundings are pleasant with genuine Italian villages (Vigo and Laggio di Cadore) on the first kilometers and wild nature afterwards. Climbing is relatively relaxed because the profile is uneven and contains only one long, steep part. The ride starts on the SS51bis at the turnoff to the Passo di Màuria. Head towards the Passo di Màuria and then, after about a kilometer in the village of Pèlos di Cadore, turn left towards Vigo. Between Pèlos and Vigo lies a relatively steep strip (9%) with a length of just over a kilometer. During the first ten kilometers after Vigo the slope varies widely (from 0 to 9%) around an average of 5.1%. This relatively easy part ends at the first of twelve hairpin bends. These mark the following four kilometers, the hardest part of the ascent (7-10%) with two strips of 250 meters with a slope of 11%. After that the last few hundred meters to the pass are easy.